China is the largest passenger car market in the world, bigger than ours, even, and yet most of us outside of China know very little about its past. In America, everyone knows about our charming and embarrassing car history, our AMC Gremlins and Cadillac Cimarrons and King Midgets. We don’t usually get to read China’s automotive teenage diary, so let’s try and change that, staring with the Haiyan SW710. China has plenty of people, and lots of those people are crammed into huge, dense cities, which is a perfect recipe for microcars. Back in 1966, the shadowy group of murmuring oligarchs that make the grand plans about what the various Chinese car factories should build, and they decreed a microcar be born: the Haiyan (that means sea swallow) SW710. The SW710 I think is a pretty charming-looking little microcar, appearing to be a chunky milkshake of a number of other microcars of the era: you can see some Goggomobil in there, maybe a touch of Fiat 500, maybe some NSU Prinz, and definitely a nice heaping scoop of the best-known mid-century Communist microcar, the Soviet Zaporozets. 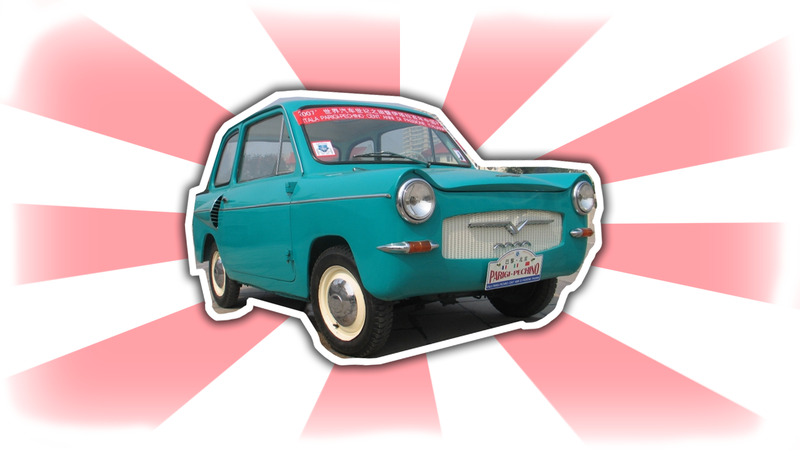 The SW710 is, like most microcars of the era, a rear-engine, rear-drive car, with a wheezy, one-banger 298cc engine. Some sources say both rear-drive (4x2) and one-wheel drive (4x1) versions were made, just in case you were the sort of Party member that felt that symmetrical drive was the sort of decadent crap the West went for. Also, look at those amazing airintake-trumpets for the engine on the sides, there. A 300cc 1-cylinder with 13hp @ 5200rpm, top speed was claimed at a not-too-bad 60km/h. Curb weigh of the HY710 was 820 kilo. It was really small, size: 2940/1430/1360, wheelbase was 1830. How many cars were made is as usual for Chinese motorvehicles from those days very uncertain, but a few hundred is is the absolute max. From what I can tell, very few were actually made, with some sources reporting about 100 copies, many of which seemed to have been used as cozy city taxis. There’s only one example left, in the hands of noted Chinese car collector Bai Guang. Sure, it seems like a pretty minimal and miserable little shitbox, but there’s something about its odd looks and mishmash of design styles (especially those sort-of-fins at the rear) that make the SW710 feel like the automotive equivalent of a longhorn cowfish: small, strange-looking, mildly useless, but somehow endearing, and I’d sort of love to have one. Just not in an aquarium. Why is this ad coming up in a forum about Chinese cars? Is there something about these cars I should know? Something that involves foul-smelling pus in my armpits? That sounds so very very awful. Anyway, now you know about the Haiyan SW710: the choice of people with stinky armpit oozes!